It is said, but cannot be proven, that the orange carrot was cultivated in the 17th century by Dutch growers. It is thought that the carrot was cultivated orange as a tribute to William of Orange, who led the the struggle for Dutch independence. Whatever the origin of the orange carrot, the Long Orange Dutch carrot, first written about in 1721, is the forebear of the orange Horn carrot varieties so abundant at supermarkets today. History states the first mention of growing carrots was in Iran. Carrots cultivated before 1721 were of different colors, like purple, red, yellow and white. The orange carrot we buy today is crossed from the later two colors, yellow and white. It is note worthy, the nutritional benefits of rainbow carrots. Four (4) ounces or 1/2 a cup has 157% of the daily value of vitamin-A, 14% of the daily need of vitamin-C, 337 mg of potassium, and 3% of the daily need of calcium, and iron. Four ounces also have about 3 grams of fiber. Our featured recipe is prepared using wild organic rainbow carrots. It is a simple and delicious salad. Fast and easy to make. 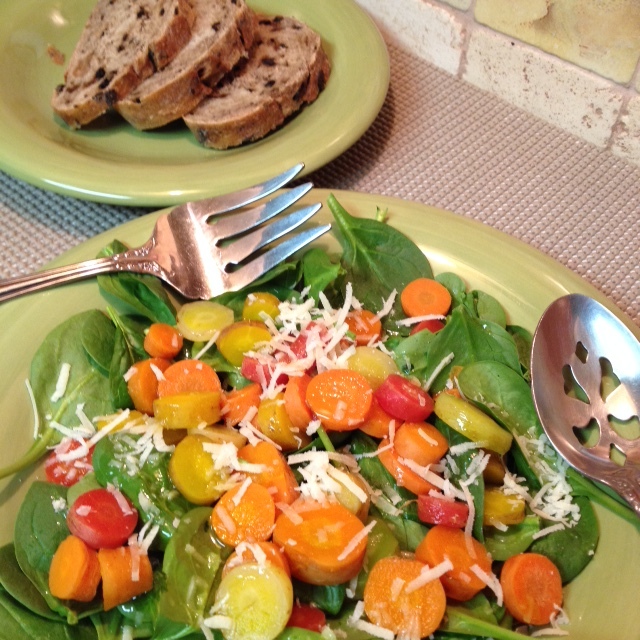 Our featured salad, Organic Rainbow Carrots and Spinach Salad will need the following. Wash and slice carrots, but do not peel. Place into a steamer basket over boiling water and steam, about 5 minutes. Cool and set aside. Plate spinach on a large salad plate. Top with cooled carrots. Drizzle ginger syrup over vegetables, then drizzle olive oil. Top with cheese. 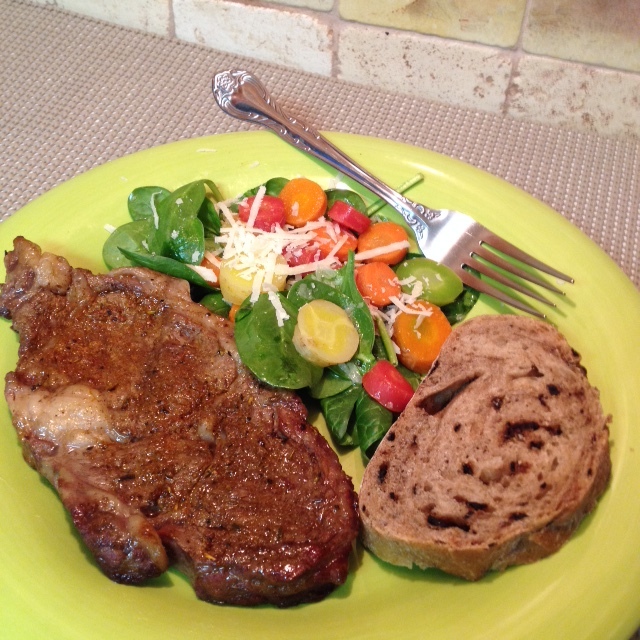 We enjoyed the salad with a Caribbean Spiced Rubbed Beef Rib Steak and slices of olive bread. This entry was posted in Soups and Salads and tagged Caribbean Spiced Rubbed Beef Rib Steak, Carrot, Carrot cake, carrot salad, carrot varieties, Cumin, Dutch independence, Ginger, ginger syrup, olive bread, Olive oil, orange carrot, Rib Steak, Roasting, Salad, Sea salt, Spinach Salad, spinach slad, Vinegar, William of Orange. Bookmark the permalink. Great salad and a wonderful way to add color to your menu during winter. Thanks Jovina. As for color, I do believe it is part of the process of enjoying food. Good recipe, Randy! It appears to be uncomplicated…even I might be able to pull this one off! 🙂 Thanks, buddy! Thanks for stopping by and I hope you give easy salad recipe a try.